Guidance for citing sources in Chicago style. Located in Concordia Library 1st floor. Use the manual to find citation examples for less often used materials and for information on formatting papers. What's the Difference Between a Footnote & a Bibliography? "I've heard some people say footnote, and other people say bibliography. What's the difference?" Footnotes and bibliographies are linked to each other. When you cite a source, you're providing credit for that source in two different places: a footnote and an entry in the bibliography. The footnote is placed within the text where you refer to the source. This is a short version of information about the source. It looks like this: 2. Bradbury, Ray. Fahrenheit 451. New York: Ballantine Books, 1970. The information in the footnote should always match the bibliographic entry. That way, if a reader wants to find more information about a source while reading your work, s/he can just flip to the back to locate the source in your bibliography according to the information you provided in your foonote. It's also a good idea to double-check that all of the sources in the footnotes are in the bibliography, and vice versa. In other words, don't include sources in your bibliography that you didn't quote or paraphase; that's called "bib padding." These are the programs sorted according to most commonly used style. Citations (footnotes and bibliographies) perform very important roles in research, both at an academic and a professional level. They tell your readers where you located your information. They tell your professors what kind of research you performed. They connect your research to the work of other researchers and scholars. They give you authority as a writer and researcher. You should use citations whenever you quote, paraphrase, or summarize someone else's work. Quotations are exact duplicates of other people's words. Paraphrases are other people's ideas rewritten in your own words. They're usually about the same length as the original material. Summaries are other people's ideas that you've shortened to highlight the main ideas. They're always shorter than the original material. You should cite your sources whenever you write ideas that aren't your original ideas. For specific situations, take a look at: Plagiarism Resources. While there are different citation styles (APA, MLA, Chicago, etc. ), they all serve the same purpose. And they all have similar fill-in-the-blank properties. Think of them like jigsaw puzzles. You just have to put the pieces together. 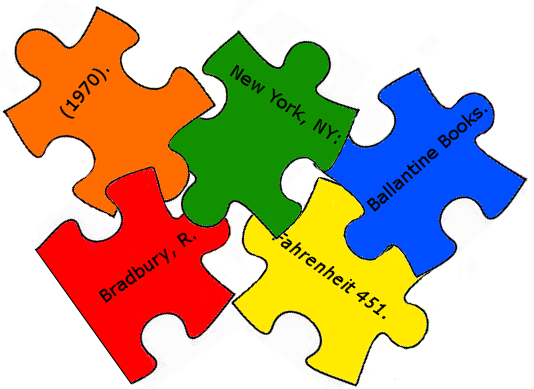 And just as different jigsaw puzzles are completed in different ways, different citations have different orders of placement. Also, syntax and punctuation matter in the creation of citations. If you place the citation elements in the wrong order with incorrect punctuation, the citation won't work — just as the jigsaw pieces wouldn't fit together if the shapes or edges weren't exact matches. Who. Who's responsible for writing the source? Author, editor, translator. What. What's the name of the source? Book, article, or journal title; series title; subtitle; etc. Where. Who produced the source and where are they located? Publisher, publisher location, website URL or DOI, etc. Is the source from a specific location? Book chapter, edition, journal volume and issue number, etc. When. When was the source published or produced? Date. Sometimes just year; sometimes month and year; sometimes day, month, and year. Some citation and reference styles want to know the source's format, such as print or web, as well as when you accessed the material.